Thousands of colorful umbrellas are now up at the Municipal Plaza of Kiamba in Sarangani Province as the town is set to celebrate its 69th Foundation Anniversary and 13th Timpuyog Festival. Thousands of umbrellas at Municipal Plaza of Kiamba. The umbrellas symbolizes the unity of the people of Kiamba. Timpuyog is an Ilocano term for unity. Exciting activities of this year's week-long celebration which will start on February 7 includes cultural shows, sports activities, concerts and more. 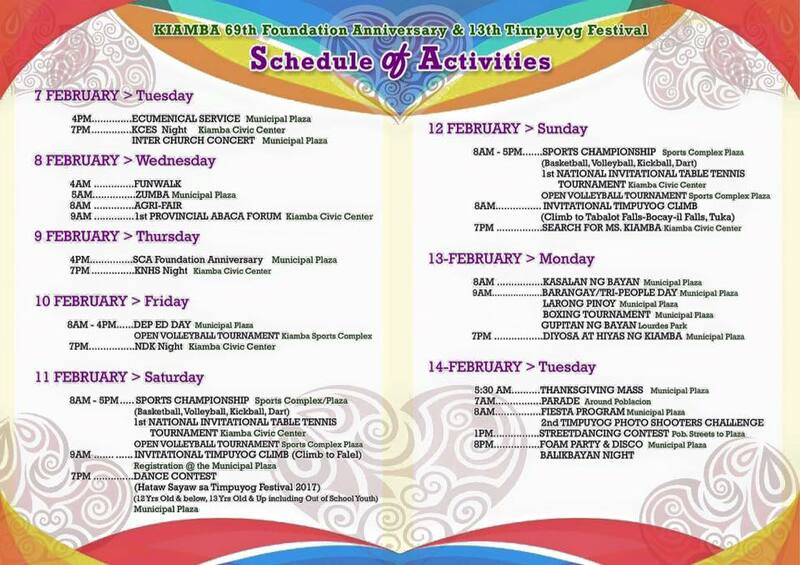 If you want to be part of this year's Timpuyog Festival, check out the schedule of activities below. Timpuyog is an Ilocano term for unity. Exciting activities of this year's week-long celebration which will start on February 7 includes cultural shows, sports activities, concerts and more.